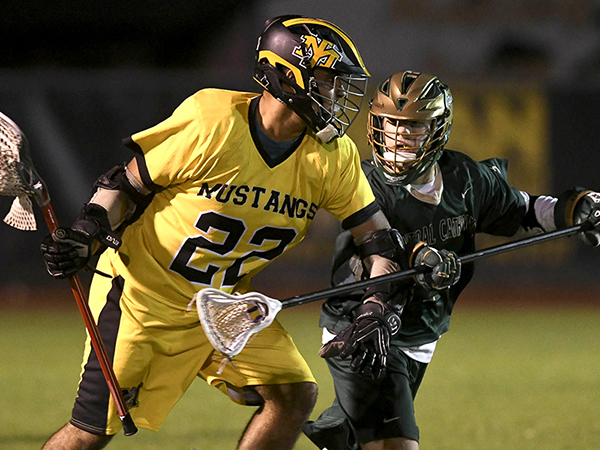 Merritt Island might be best known as the home of NASA’s John F. Kennedy Space Center, but it is also home to the Mustangs of Merritt Island High School. The community is part of Brevard County which is about an hour’s drive east of Walt Disney World in Orlando. Originally, a mostly agricultural island, the space race put this area on the map in the 1950s and 1960s and changed the island into more of a residential and tourist-friendly area. The Merritt Island lacrosse program has been around since at least 2011. Most recently they have won or shared conference championships in 2017 and 2018. We started working with the program ahead of the 2016 season and have kept the relationship going since. For the last couple years, the wrap design has stayed relatively consistent. The original design offered a clean look with simple lines and a predominately black and yellow color scheme. An oversized “MI” logo in a block athletic font dominates one side of the helmet while the opposite side featured an oversized player number. Perhaps the most unique design detail is the inset tapered stripping in the center of the mohawk stripes and bottom back panel. Additional details were added to round out the design such as the triple horseshoe logo on the chin and an American flag on the back-patch decal. When it came time to produce wraps for the 2018 season, the coaching staff was looking for a bit of a change to the look. While it can be a good idea to maintain brand consistency from season to season, you should not be afraid to change things up. For the 2018 helmets, the player number was replaced with an oversized mustang logo that is tightly cropped. Smaller player numbers were then applied to the back-patch decal replacing the flag decal. Perhaps the largest change made was in the finish of the wraps. In the past, the Merritt Island wraps were produced using our standard gloss finish. This year however, the wraps were done in a matte finish. 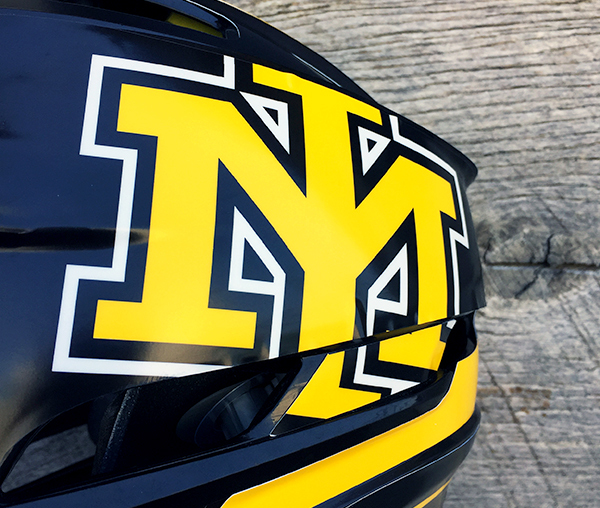 A matte finish has been a popular trend for lacrosse helmet wraps for a few years now. Previously, the only type of finish offered was high gloss. A gloss finish can look great, but a matte finish provides a softer feel. Because it absorbs light rather than reflecting it, design details often are easier to distinguish from greater distances. A matte finish upgrade can be had for just an extra $2 per wrap over the price of a gloss wrap. We’re excited to have worked with Merritt Island again this year and think the wraps turned out great. The newly added mustang logo was a nice, on-brand change, but it’s the matte finish that really makes their helmets stand out. If you have a unique idea or want to show up your competition with a new look this year, we’re happy to help. 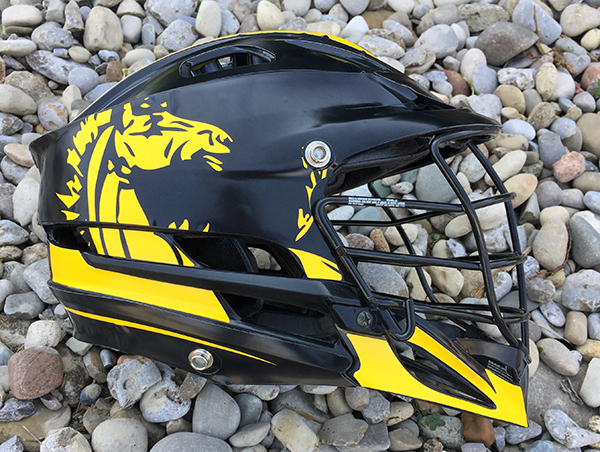 JackWraps® offers a full range of lacrosse helmet decals from traditional decal kits to full helmet wraps. We would be happy to discuss your project and get a free proof and quote together for your team. Reach out to one of our reps today to get your project started.